Enlivened with a rich history and striking architecture, this diverse neighborhood offers an array of restaurants, retail shops, and nightlife to help you find the perfect work-life balance. Plus, getting to work is easy with parking, bike storage, and public transportation all nearby. Whatever your industry or particular corporate business requirements, join this office today for a stunning environment in a convenient location. This building is dog- friendly and you can take your dogs while you work and be more productive. The private offices as much as the common areas are designed to boost productivity and add a touch of prestige to meetings held by entrepreneurs and executives in this space. Stay caffeinated throughout the day with an infinite stream of freshly roasted coffee. This building also has a brainstorming room to get the ideas flowing in a space designed for spitballing, thanks to writeable walls and standup-friendly furniture. This office has beautiful views of the mountains that surrounds this energetic city. If your clients love to gamble you can take them to Winland Casino as is near to this office. At Winland Casino you can entertain your clients while building a relationship with them. This office is also close to many parks where you can go for a walk or a run to keep a healthy lifestyle. The heart-and-soul of this location, these lounges are living-room-style spaces designed for creativity, comfort, and productivity. This office is also close to many parks where you can go for a walk or a run to keep a healthy lifestyle. Or you just can go relax and read a book in order to have a balance lifestyle in order to keep building your business. This office is a true inspiration for entrepreneurs and you and your clients will feel that you are in paradise. Change how you work and come to this office and work with like minded entrepreneurs and you will feel the energy of this office is really different from other normal offices. With a fantastic location, this centre provides furnished office space, boardrooms and more. Benefitting from superb infrastructure, this centre will provide your business with a prestigious address that is sure to impress clients. This post-modernist tower is home to a number of furnished offices with 24-hour access, in Battalion of San Patricio, a beautiful area in Garza García. The tower has underground parking and is surrounded by hotels and modern buildings. This high-quality serviced office is ideally located in a safe and pleasant area, and is surrounded by several major corporations. A number of offices are available to suit your needs, and the friendly yet professional staff are on hand to help your business run smoothly. The regional transport links are also of an exceptional standard and make the center easily accessible via both road and rail networks. This office is located in the heart of the municipality of San Pedro Garza Garcia and will have the LEED Silver certification by the US Green Building Council (USGBC). The center features a vast array of fantastic local services and sites of public interest within close proximity to the center and there a number of luxurious accommodation providers and entertainment venues within the general vicinity of the building itself. A unique combination of location and building quality, this building has office of various sizes, and available on flexible contract terms. The offices feature secretarial and IT systems support, provided by an experienced and reputable company. The building is centrally located, in a prestigious area of Monterrey, with easy access to the rest of the city. Available are fully furnished offices in a modern building in Monterrey. On offer are flexible contracts on offices in a range of different sizes. The centre has the latest technology infrastructure, and has business support services supplied by an experienced firm, with a strong track record. The centre is located on one of Monterrey's main streets, and has convenient access to a range of restaurants, for business entertainment, and the city's major transport links. This is a modern, ""intelligent"" office building in Monterrey. Many different office sizes are available, and the lease terms are negotiable. There is modern communications infrastructure, and a dedicated professional support staff. The centre is situated on the main avenue of one of the finest areas in Monterrey. The area boasts hotels and excellent restaurants. 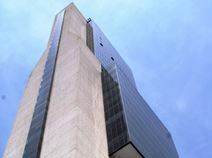 This business centre is located in a landmark office tower in the most rapidly developing business district of Monterrey. There are spectacular views from almost all of the offices, and they come fully equipped. In the vicinity of the building are all manner of amenities, including top hotels, banks and restaurants. A modern and strategically located business centre, offering fully furnished and serviced offices on flexible leasing contracts. 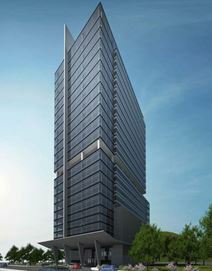 This is the tallest building in northern Mexico, and is the ideal solution for tenants looking for a prestigious address. 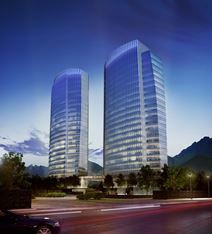 The building is in the business hub of Monterrey, and has good transport links to other parts of the city. These offices are ready-to-use and suitable for three to six people while coworking space is also available. The AAA building provide innovative facilities, a large terrace area and an excellent location on Blvd. Antonio L. Rodriguez. 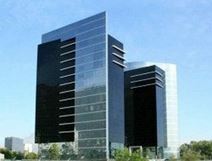 Fully furnished offices to let in a modern office building in Monterrey. This building features secure underground parking spaces for tenants, and boasts fantastic views of the nearby mountains. The centre has convenient access to the highway system, and is within easy walk of the Hilton Hotel. 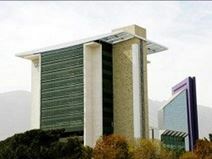 Fully furnished Monterrey offices to let, in a modern, high-tech building. This strategically located building features top quality secretarial staff, and tech support. The prestigious area of Monterrey where it is located has easy access to the major businesses in the city, and is within easy reach of both residential and industrial areas. Monterrey offices available to let, in a building that houses cutting-edge telecoms systems, and is staffed by an excellent business support team. This centre is located in San Pedro Garza Garcia, an exclusive of the city. The area is renowned for its designer label retail outlets, finance industry companies and fine dining. Fully furnished office space to let in Monterrey. Providing business support in this excellent centre are secretarial and tech support teams, supplied by a firm with an excellent record of providing business services to a range of clients. The area has a range of hotels and restaurants, and there is convenient access to the city's transport links. Offering unparalleled views of the golf course and the Sierra Madre this office facility in the township of San Pedro Garza García provides fully equipped workspace available for immediate occupation. A short walk from a range of shopping and food options. Furnished executive suites to let in Monterrey, Mexico. The centre comes with excellent professional support staff. The building is not far from the Monterrey outlet of the Palacio de Hierro department store. 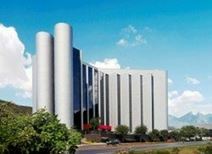 This business centre features an intelligent, modern design, and is located in an excellent area of Monterrey. Secretarial and technological support services are provided by a highly reputable company, with a long history of satisfied customers. The lease terms on offices in this centre are flexible.